Dialogues draws together the multitude of material produced through the ongoing off the route series and presents the audience with multiple possibilities of experiencing this body of work. Part live event, part documentation – this is an exhibition in flux, constantly accumulating and evolving. Dialogues deliberately blurs the distinction between the ‘live’ and the ‘recorded’, where each individual experience constitutes the artwork – here there is no criterion for the ‘truth’ in experience, no one location where the artwork resides. Experience, as American Philosopher John Dewey argues, ‘occurs continuously’ (1980, p36). But to have an experience requires, according to Dewey, for the situation to ‘run its course to fulfillment’ (1980, p36). In the ‘hi-tech, spectacle rich environments of the West’ our attention is split by a never-ending stream of distraction, and so our experiences are frequently interrupted (Heathfield 2004, p7). For reality, as Richard Flood argues, is ‘a collage composed of whatever grabs our attention, and the competition is limitless’ (2007, p11). Our daily lives are filled with simultaneous experiences – ‘immediate news, mobile phones, imaging technologies, web-casts and reality TV’ – further adding to our distraction (Heathfield 2004, p7). How, in such a fast-paced climate, do we understand the notion of ‘experience’? How can we locate ourselves in the ‘now’? How can we slow down? When so much of daily life is fast-paced, what would happen if you gathered a group of people in a space and asked them to perform one simple task, repeatedly and simultaneously for an hour? These were the motivating questions for the off the route – a durational live encounter that invites visitors to participate in experimental performative situations. On arrival participants are assigned one of three tasks: to speak – to read aloud a given quote repeatedly; to type – to record on a typewriter everything they hear; to observe – to watch and listen taking in the event as it unfolds. All three tasks are to be carried out for one-hour, at which point everyone ceases and holds silence and stillness. Off the Route emerged from another body of work that was concerned with mapping current attitudes towards the ‘other’ in Australia. This series stemmed from an initial question as to how we generated attitudes and understanding from a variety of information sources, particularly in today’s media driven, information overload society. The initial quotes were drawn from a variety of texts that engaged with these concerns, including Nicolas Bourriaud’s The Radicant (2009), Edward Said’s Orientialism (1978) and Doreen Massey’s A Global Sense of Place (1991). Also included was statistical information from the 2006 Australian census, detailing the total percentage of the population that was born overseas within specific regions. These were combined with quotes from texts that engaged with Off the route’s boarder investigation into the site of the artwork and the blurred relationship between the live and the copy. These include a line from Tim Etchells’Nights In This City, itself documentation of ‘a performance now past’, and a quote from Robert Smithson’s Statement (1969) relating to the site and non-site of the artwork (Etchells in Kaye 2000, p13). Off the route is largely an experiential situation that operates through the social relations and exchanges of those present. It calls to mind Richard Schechner’s assertion that ‘performance isn’t in anything, but existsbetween’ things (2002, p24). How each variation of off the route unfolds depends on the group dynamics. How each individual interprets the simple instructions and performs the task (with utter seriousness or with a sense of playfulness?) alters the shape of the experience for the entire group. Off the route’s reliance on interpretation of instructions, its ephemeral nature and even its engagement with documentation, is influenced in part by Fluxus. Certain examples come to mind, such as George Brecht’s compilation of ‘texts’ and ‘scores’, which often include instructions as simple as ‘paint a single straight ladder white…’ or Le Monte Young’s composition ‘draw a straight line and follow it’ (Armstrong & Rothfuss 1993, p18, p31). These simple instructions are open to interpretation ‘by anyone at any time’, presenting a challenge to authorship through the possibility of multiplicity (Armstrong & Rothfuss 1993, p18). Off the route is a primarily a relational artwork, where the experience is the media. The experience is one of intensity. The constant stream of noise, a blending of voices and keys, and typewriters bells, exists in stark contrast with the silence – a deafening stillness after such cacophony. But, as John Cage argues, there is no such thing as silence for there is ‘always something to hear’ (1995, p8). For when the intensity of the sound suddenly stops, our minds re-focus and slowly we begin to hear the little things around us that we normally allow to pass us by (Cage 1995, p8). For a short space we are still, in the ‘now’. While the live encounter is crucial for this artwork to exist, it is not the only way to experience it. Off the route does not operate solely as a live encounter, but is devised to be self-documenting – where the record is part of its internal logic. After all documenting the shifting relations within the live event itself is one of the three tasks assigned to the participants. Rather than a one-off, unique experience it is an ongoing series, cyclical in nature. For each additional version ‘quotes’ the previous through using the prior paper documents as the starting point. Therefore, this body of work engages with our dual desire to be present, a live witness to the ‘here and now’, but to also ‘save it for later’ – to have a record (Heathfield 2004, p9). This self-reflexivity of the artwork recording its own making, is something William Raban explored in his expanded cinema piece 2’45” from 1973, in which he recorded the first live screening of his film. This documentation of the live event was then shown on the following night and was also recorded and was repeated numerous times (BFI 2011). Thus the piece 2’45” ‘quotes’ its own past, but also ‘records the history of its making’ (BFI 2011). Typically the performative artwork is thought to only occur once – this one-off live encounter constituting the ‘original’ experience. As Peggy Phelan argues, ‘performance’s only live is in the present’ (1993, p146). To experience the original is therefore considered as the ‘authentic’ experience, for as Walter Benjamin argues, ‘the presence of the original is the prerequisite to the concept of authenticity’ (1999, p214). Off the route directly challenges this concept of authenticity as inextricably linked to the original. For off the route is a live experience primed for multiplicity – the various tasks that comprise the live event itself differing vastly. Frequently participants recall vastly different encounters, and therefore while this is a group exercise – it is also an individual experience, resulting in multiple perspectives within the one situation. The presentation of this series in the Dialogues exhibition, which also includes sound and paper documentation, furthers this multiplicity of perspectives. While Dialogues presents live daily versions of off the route, the traces are incorporated into the exhibition itself. 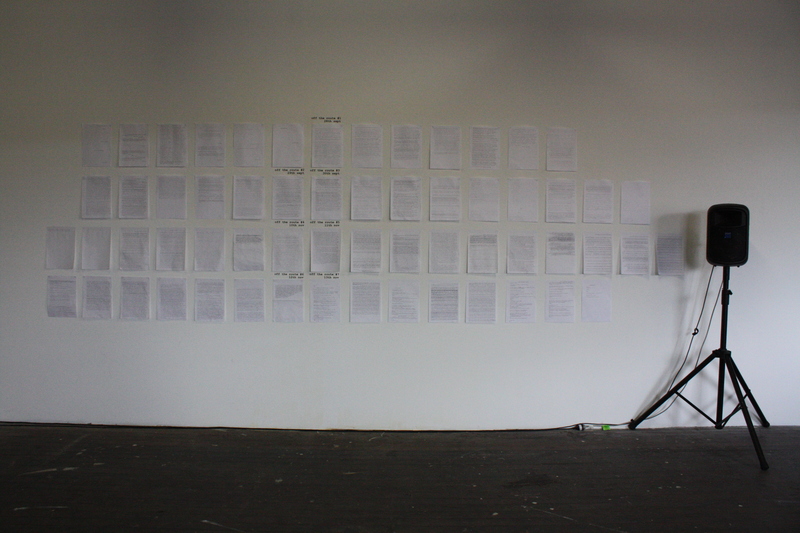 The audio recordings become a sound installation and the paper documents a kind of ‘expanded’ publication. These documentations of the live events are both a trace and a direct experience in their own right. Thus constituting what Henry M. Sayre refers to as a ‘double stance’ – where the artwork can be understood as both absence and presence (1989, p4). Yet these traces do not exist as just residues, but like the live event itself, they continue to grow. For as each new live event produces yet another multitude of material, these are added to the respective forms of documentation. ‘Old’ and ‘new’ traces converge within the one space. They compress and transpose time/space frames onto one another, actively blurring the distinction between the live and the recorded. Armstrong, E & Rothfuss, J (eds.) 1993, In the Spirit of Fluxus, Walker Art Centre, Minnesota. Benjamin, W 1999, ‘The Work of Art in the Age of Mechanical Reproduction’, Illuminations, Arendt, H (ed. ), Zorn, H (trans. ), Pimlico, London, pp211-244. Cage, J 1995, Silence: Lectures and Writings by John Cage, Marion Boyars, London. Dewey, J 1980, Art as Experience, Perigree edn. Penguin Books Ltd, New York. Flood, R (ed.) 2007, Unmonumental: the Object in the 21st Century, Phaidon and New Museum, London and New York. Heathfield, A (ed.) 2004, ‘Alive’, Live: Art and Performance, Tate Publishing, London, pp6-13. Phelan, P 1993, ‘The Ontology of Performance: Representation without Reproduction’, Unmarked: The politics of Performance, Routledge, London and New York, pp146-166. Sayre, H M 1989, ‘Introduction: The Object of Performance’, The Object of Performance: The American Avant-Garde since 1970, University of Chicago Press, Chicago and London, pp1-34. Schechener, R 2002, Performance Studies: An Introduction, Routledge, London and New York.